In studying the Bible, it is possible to get lost in the forest for the trees. Hence, Bible survey is necessary so that one can see the total biblical context of what is being studied and not get lost somewhere on a leaf on a twig on a branch of some isolated tree. Likewise, in doing a detailed study of a text it is possible to lose the overall logical flow of the text. One way to counter this tendency is to outline the logic of the passage. No book in the Bible is more suited for doing this than the Book of Romans. It has been long held that the logic of the book of Romans is tight. However, few have attempted to successfully untie the knot. This book is an admirable attempt to overcome that difficulty. One reason for this is the lack of logical skills on the part of many exegetes. Another is the lack of exegetical skills on the part of logicians. Shawn Nelson has combined skills in both areas to produce a valuable tool for students of God’s Word. Another axiom of interpretation is the failure to understand a text in its context. Here again, the inability to see the logical flow of the text comes into play. Few interpreters have taken the time and/or have the talent to outline the logical form of the passage. But without this, one can easily get lost in a sea of words. The end result of this is, at best, a word study of the text, not a correct interpretation of it. Again, the only cure for this is to have the ability and to take the time to outline the passage in its logical form. 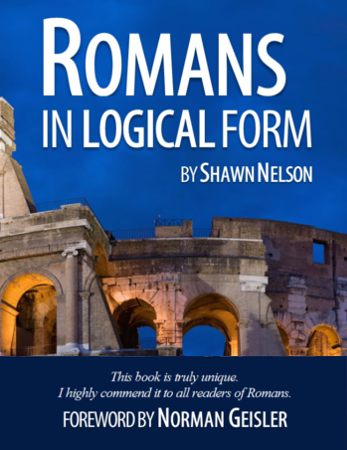 This small but valuable book lays out the logic of the entire book of Romans in a way that is indispensable to properly understand one of the most important books in the Bible. It is truly unique. I highly commend it to all readers of Romans. Kindle only. Ask Shawn if he wants to take it over? 171 pages so we could make a print book out of it. Previous PostThe Battle for the ResurrectionNext PostWhat in Cremation is Going On?